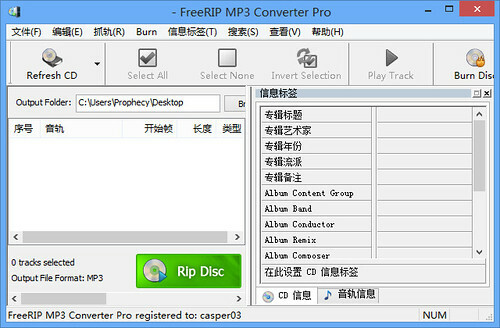 FreeRIP MP3 Converter is an advanced CD to MP3 Converter that comes packed with features. At its core, FreeRIP MP3 Converter reads audio from your CDs and allows you to save them to your computer in a variety of digital formats including WMA, MP3, Ogg, Wav, or FLAC audio files (this process is known as CD ripping or CD to MP3 conversion). Converting your CD audio collection to digital audio files is a breeze with FreeRIP MP3 Converter: download and install FreeRIP MP3 Converter, put your audio CD into your computer’s CD drive, run FreeRIP MP3 Converter and click on the Rip button. Once you have your digital audio tracks saved in your preferred format, it’s easy to load them to your favorite audio player (e.g. a portable MP3 player such as an Apple iPod™, Creative Zen Player™ or Sony Walkman™). You can also move tracks to an advanced mobile phone, or burn them to a MP3 CD’s to listen in your MP3 car stereo, home stereo or Discman™. FreeRIP MP3 Converter supports the high quality, lossless compression named FLAC, which is widely used and supported by audiophiles. If you want to be sure to save all the richest details in your audio tracks, save them in the FLAC format.